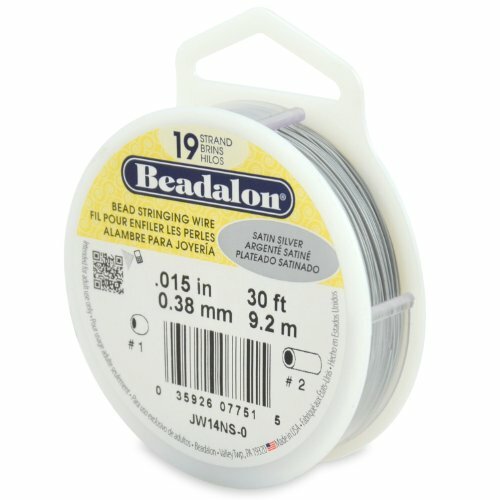 Beadalon Bead Wire combines the soft, supple feel of thread with the strength and longevity of wire. Designed specifically for stringing ceramic, glass, metal, stone, seed beads, and freshwater pearls. Allows designs to drape naturally. This miniature, multi-strand wire cable is nylon coated. Knottable, near 0% stretch, abrasion resistant, water proof, UV resistant, ultra flexible, and kink resistant. 19 Strand .015" Satin Silver 30'- 19 strands of stainless steel wire coated with silver colored nylon. Use with size 1 crimp bead or size 2 crimp tube.